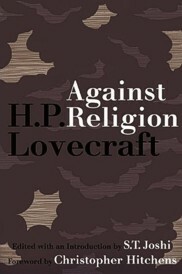 Against Religion contains the major writings on religion, materialism, and spirituality by master horror writer H.P. Lovecraft. Including an introduction and notes by celebrated Lovecraft scholar S.T. Joshi and a foreword by noted atheist and writer Christopher Hitchens, this essential edition brings a new voice to the religious debate, and Lovecraft’s clairvoyant writing on the topic is as prescient today as it was during his lifetime. H.P. Lovecraft is the author of numerous weird tales, among them The Call of Cthulhu. His recent inclusion in the Library of America marks his unique contribution to the horror genre, and his continuing influence on writers in all genres today. S.T. Joshi is the author of H.P. Lovecraft: A Life, and the leading scholar and editor of Lovecraft’s work. Christopher Hitchens is the New York Times bestselling author of God Is Not Great, and editor of The Portable Atheist: Essential Readings for the Nonbeliever. Against Religion: The Atheist Writings of H.P. Lovecraft. By H.P. Lovecraft, Edited by S.T. Joshi and with a Foreword by Christopher Hitchens. New York, NY: Sporting Gentlemen; 2010; paperback; 222 pages.